Progressive Muscle Relaxation is a Form of meditation conceived by Edmund Jacobson in the U.S. in 1929. The aim pf PMR is to develop an understanding of muscular tension through the deliberate tensing and relaxation of muscles throughout the body. Jacobson devoted his system around the premise that, since muscle tension is induced by stress, then stress could surely be reduced by learning how to control muscle tension. This is similar to the notion that breathing exercises can help to reduce stress by developing breathing patterns normally associated with a calm state of mind. 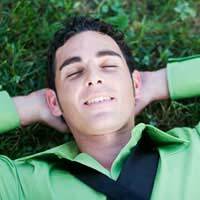 The aim of progressive relaxation is to come to a better awareness of the difference between muscle tension and muscle relaxation. Though this is a simple form of relaxation, many people are relatively unaware of their bodies, often taking for granted the tension that builds up and is present much of the time. By focusing attention on one group of muscles at a time and tensing and holding the tension for about 10 seconds before releasing that tension, it is possible to appreciate the wide gap between tension and relaxation. Upon releasing the tension you can then relax for 10 seconds before moving onto another muscle group. This exercise will bring about immediate results as you feel the benefits of muscle relaxation in comparison to tension. However, the real changes will come as you become aware of the sensation of complete relaxation and are able to take it with you into your everyday life. You are advised to practice PMR daily and at regular times in a quiet environment, much like meditation. If you suffer from muscular pain or back pain it is advisable to seek advice from a Doctor before starting PMR. Feet - Curl the toes downwards to tense. Legs - Lower and Upper. Hands - Clench to tense. Neck - Tilt your head backwards and hold. Mouth - open your mouth as wide as you can and hold. Then stick your tongue out as far as it will go and hold. Eyes - Open your eyes wide (as if surprised), and hold. Start every muscle group with a deep, but natural inhalation and exhalation of air and treat the exercise much like meditation: don't strain to try and attain results, just observe sensations as they occur, and you will soon be able to reap the benefits of this exercise.